This drink wasn't initially what I intended, but after my plans didn't quite work out, I nonetheless ended up with a refreshing, satisfying drink. Originally, I had planned to infuse homemade lemonade with fresh thyme. I tried an infusion technique involving an ISI Cream Whipper. The idea is to use nitrous oxide to quickly infuse flavor into the liquid. Unfortunately, it didn't really work. Although I'm sure the technique is great for some ingredients, I couldn't discern any thyme flavor in my lemonade. I may have to try it again sometime. However, since I already had the cream whipper out, I decided to try carbonating it. Although this isn't the express purpose for the device, it will take carbon dioxide cartridges (if you had a soda siphon, you could use that instead, but I don't). The carbonated lemonade tasted fantastic and gave the drink an extra refreshing quality. 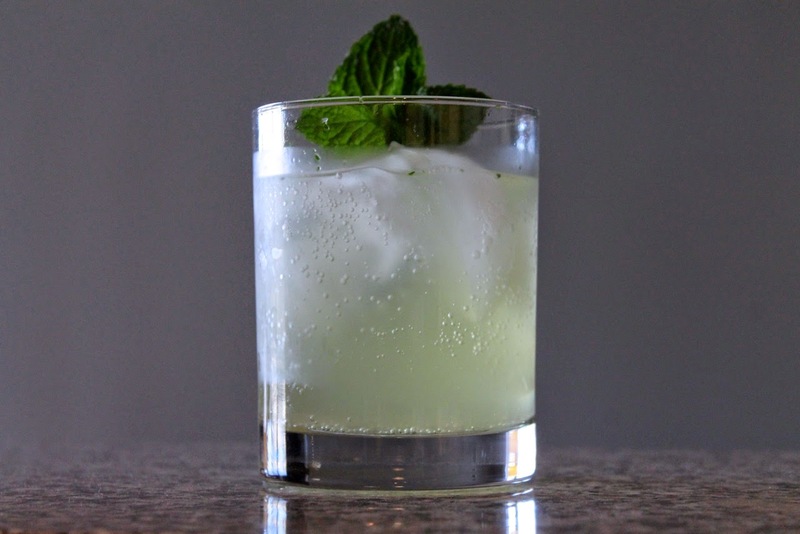 Combine 8-10 spearmint leaves and Yellow Chartreuse in a cocktail shaker. Muddle the mint leaves. Add the gin, Cocchi Americano and grapefruit bitters. Add ice and shake until cold. Strain into a rocks glass with ice. Top with carbonated lemonade and garnish with mint sprig. Combine hot water and sugar in a jar or glass measuring cup and stir until the sugar dissolves. Stir in the fresh lemon juice. Add the mixture to an ISI Cream Whipper and charge with one carbon dioxide cartridge. With the whipper in the upright position, cover the nozzle with a towel and release the pressure completely. Unscrew the top and pour out the carbonate lemonade (do not attempt to dispense the lemonade from the nozzle).